This year, I made my own Passover matzoh. Why on earth? Because Miriam and I don’t do well with gluten (we can cheat once in a while, but not two days in a row). So I wanted it to be gluten-free. 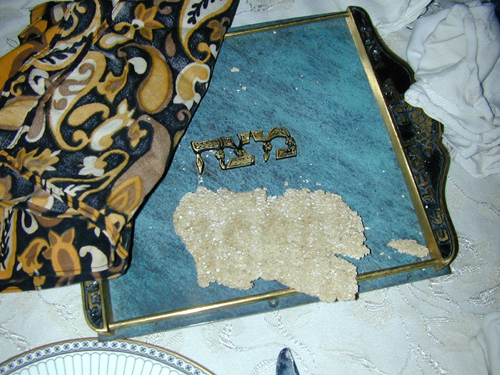 Matzoh (aka matzah, matza, matzo) used during a Passover seder must come from one of five specific grains: wheat, spelt, rye, barley, and oats. The first four are all gluten grains. These grains are forbidden during the eight days of Passover unless they are in matzoh form. There are other crackers you can make that are perfectly acceptable for use during Passover, but they aren’t from one of the five grains, so they can’t be used for the blessing. This leaves oats. Oats are in the grass family but a different subsection from the gluten grasses/grains. They don’t have any gluten themselves but are closely enough related to gluten grains like wheat that a few gluten-intolerant folks also can’t have oats. But the vast majority of celiacs and others who are gluten-free who react to oats do so because they are almost always harvested and processed on the same equipment as wheat, so they are contaminated. There do exist gluten-free oats; where the growers and processors take special care not to contaminate them. So far, they are expensive and don’t come organic. This will probably change in the future. Bob’s Red Mill is one supplier. And there is a company that takes those gluten-free oats and makes Kosher for Passover matzoh from them. A Godsend for many Jews! Also sold through MatzahOnline and distributed in stores in the US, Canada, South Africa, Israel, the UK, and Australia. But, at $35 for a box of 3 (that’s the round handshaped, though the regular aren’t much less), plus shipping, yeah…well, maybe not. So, I decided to make it myself. Some frum (strictly observent) Jews won’t make their own matzoh at all, because of some picky things that can go wrong. Others will do it but won’t accept my method, because I used oatmeal, which is already cut up. I would have tried oat grouts, but I wasn’t sure I could grind them with the equipment I have. I’m not frum or Orthodox and my Rabbi (Conservative) is cool with my doing my own matzoh, so that’s good enough for me. I did take care with the preparation though. Every piece of equipment you use must be completely cleaned of grain residue. No yeast or other leavening may be added. The time from the first possible contact with water, until the matzohs are safely in the oven baking, must not exceed 18 minutes. Technically, this means oatmeal or oat flour is out because it could have contacted water during the grinding process, but I used oatmeal anyway. I couldn’t find oat flour. I am not sure how acceptable oat grouts used in this way would be to a frum Jew and I would be curious to find out. You can double (etc) the recipe, but be sure to have extra hands to help if you are doing this within the time limit. I think I could have easily doubled it and been fine by myself, but I wanted to test the recipe and make sure I could do it fast enough, so I made two batches, each with the above amount. I carefully washed everything in-between batches. For my first batch, I used 1/2 tsp salt (not quite enough) and worked quickly without being hurried. I got them into the oven in under 10 mins. For the second batch, I worked slowly but without distraction. I made it in about 13 mins. I started the clock when I poured the oatmeal into the measuring cup, since it was slightly damp from rinsing and drying. Measure the oatmeal, pour into a food processor with a normal blade, or the grinder of your choice. Grind fairly fine, with the salt, at least so 2/3 is flour, if not more. Set aside a bit of flour and put the rest into a bowl. Add most of the water (most of the recipes for wheat matzoh call for 2 or 3 times the amount of water. To my surprise, the oats on took half a cup). Knead the dough well, adding more flour or water as needed. Spend a good 2-3 minutes on kneading. 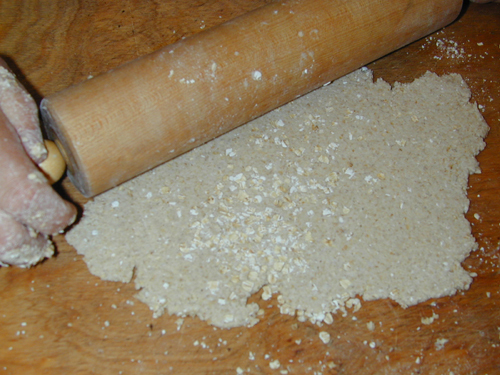 Put on to a surface, use the extra flour for the top and bottom, and roll out with a rolling pin. You want it as thin as possible without breaking. If you are a skilled baker, your results will not look like mine. 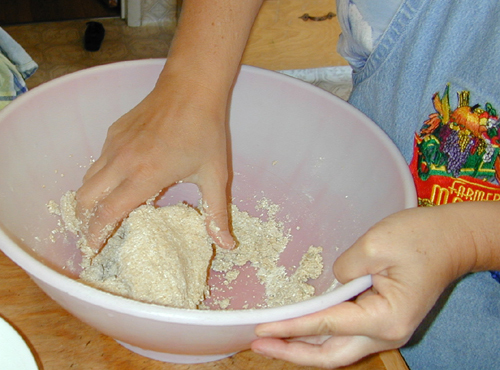 Use a dough scraper, or other wide thin utensil, to pick up dough in one piece. Place on to an unseasoned baking tray. I used a broiling pan so the heat would distribute more evenly. Bake at 400*F for several minutes, until crisp. Turn once halfway through. These took about 13 minutes or so to cook. They may be slightly bendy when they come out, but they’ll firm up as they cool. Don’t make the mistake we did and store them in a container when still warm. Let them cool first. Otherwise, they start to get soft again. Ours were slightly leathery after a couple of hours. These matzohs have real flavor. No cardboard crackers here. Our seder guests inhaled them. Usually we have lots of leftover matzoh, but this time we were lucky to have enough for the Affikomen. Basic recipe and instructions for making your own. Assumes you are using wheat or spelt. 2 cups flour to 1 cup water. Recipe and instructions using a speciality flour (probably wheat). 3 cups flour to 1 cup water. 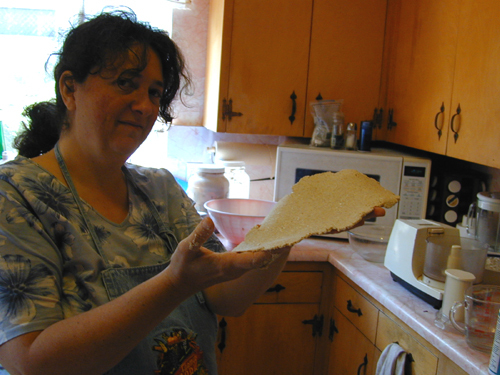 No recipes but general info and a cool picture of homemade matzah. Almond-based Passover-safe cracker recipe. Full recipe with pictures. 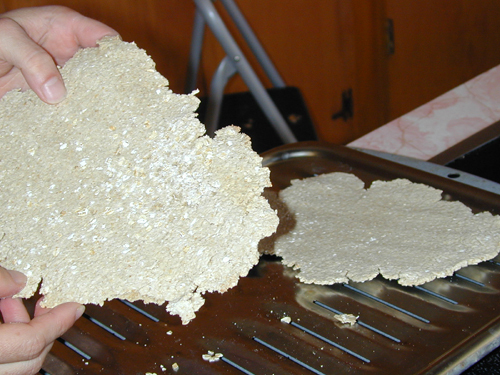 Rabbi E Kestenbaum, of the UK, manufactures Oat Matzah from Israel grown oats. Hi Benjamin, if you look at the article again, you’ll see that I already have a link to this site. And that it runs upwards of $35 a box, plus shipping if you’re not local to a retailer. I’m a do-it-yourself type of person when it comes to food (we’re making our own gefelte fish again this year too) and especially when we save so much money. We use regular oats (since we’re not celiac and don’t react to the wheat contamination) so the cost for a box’s worth is a couple of bucks. Use the certified gluten-free oats and the cost maybe goes up to $5 or $6. I’m sure the Rabbi has a lovely product, but my article is for those who want to make their own. It’s not just economical, it’s fun! I thought the rule was that it must be totally baked in 18 minutes, not just in the oven. I’ve sent the question in to my rabbi for clarification, but can it be easily done in 18 minutes?? Hi Andrine, my Rabbi was very clear that they only had to be in the oven by the 18 minute mark. Since they take 13+ minutes to cook, it would be very difficult to get it done under time if the baking time counted. I would be interested to hear what your Rabbi and others have to say. 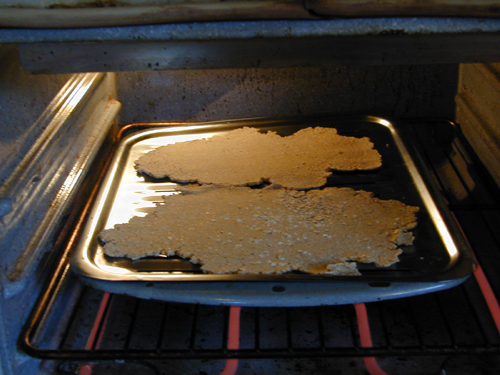 The eighteen minutes is counted from the moment that the flour comes into contact with water until the Matzah is removed from the oven. I wish you every success with your Matzah baking! for the congregation, lease send me some Matza packets at leaast 3 small packets. I am so glad I found this! This is my first gluten free Passover and I am now sure how it’s all going to come together. One question: can you grind up this matzoh to make meal? I would be so happy if I could still have matzoh balls! Bro:chandra, I think you have me confused with a vendor. But you can make your own matzoh very easily and for next to nothing too. Melisa, I have made matzoh meal out of it but I haven’t tried matzoh balls. I miss them too but my daughter’s super egg allergic and I don’t think they’d work well without egg (I sub for lots of things but not sure about this). These matzoh aren’t as light and airy as the commercial wheat ones and sometimes they stay a bit leathery, so you’ll want to make sure they’re completely dry. A food processor or good blender should make quick work of turning them in to meal or flour. When I was making them last year I tried to do too much at once and ran out of time, so instead of rolling out the last of the dough, I crumbled it up and put it on the baking sheet. Matzoh farfel! I think this would work really nicely to make meal. P.S. Please post and tell us how they came out. Thanks for this! I needed to make some G-F matzoh for my daughter’s school Passover celebration, and this really saved me. I sent this to my sister. Maybe she will make matzoh for us this year. I have some baking right now, my husband is sniffing the oven like a puppy! Hope it’s firm enough, needed lots more oat flour, could be the weather. Now it feels more like passover. Awesome. I usually make them the day of. I find they can get leathery overnight. But you can just toast them before the seder.